On Wednesday 31st March Ivan Bennett, Design Manger for London Buses, delivered a presentation on the design and development of Bus infrastructure furniture and products at Transport for London’s offices in Southwark. This article gives and overview of the evening and highlights some of the key topics discussed. As part of Transport for London (TfL), London Buses is responsible for securing the provision of bus services throughout Greater London in a safe, efficient manner, while encouraging the use of buses and public transport. Surface Transport Infrastructure Development are responsible for the design and development, specification, installation and maintenance of the supporting infrastructure within Greater London. As the main point of contact with passengers, bus stops in London currently total over 19,000. Mike Wolff, Chairman of the SDS, introduced Ivan and highlighted that the society often discuss the graphic design and strategy of wayfinding systems, but talk less about the design of products. That in mind he was very keen to get the event underway. Ivan began his presentation by putting the scale of the London Bus project into perspective. Every weekday over 6,500 scheduled buses carry around 6.25 million passengers on over 700 different routes, amounting to over 1.7 billion journeys a year. 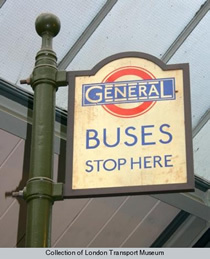 He was also keen to point out that the first use of the iconic roundel was the 19th-century symbol of the London General Omnibus Company; its usage on the Underground came later. Illustrations of old shelters showed how little the identity had changed over the years and demonstrated how forward thinking London were in a period hung up on embellishment. Ivan emphasised the importance and influence of Frank Pick, head of the London Underground in the 1910s and 1920s and of the newly merged London Transport in the 1930s. Frank was instrumental in establishing the world’s most progressive public transport system and an exemplar of design management. Ivan went on to explain how Frank’s vision influenced the design of London bus products, including those we see on the streets today. Even in the early 19th century, London Transport realised the importance of these values. How long does the product need to last? How often will the product need to be updated? How will the product be maintained? Do the individual materials proposed work together? Are the materials used sustainable? Do the materials work within the surrounding environment? What is the life span of individual materials? How will materials be disposed of at the end of the products life? Using a full scale replica of a bus stand located at the front of the room, Ivan described in detail the design of the current product used at bus stops. Many of the components are easily switchable. Ivan demonstrated how using a tiling system, bus stop numbers could be changed and moved almost like pieces of a jigsaw puzzle. A good example of this simplification of information is the timetable, where individual times have been omitted and instead only first and last buses are listed along with the general frequency of buses throughout the day. 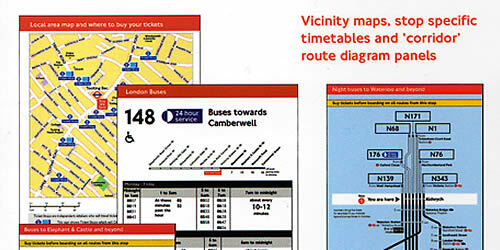 Example: Transport for London Journey Planner. One reason other systems have failed is the lack of continuity. 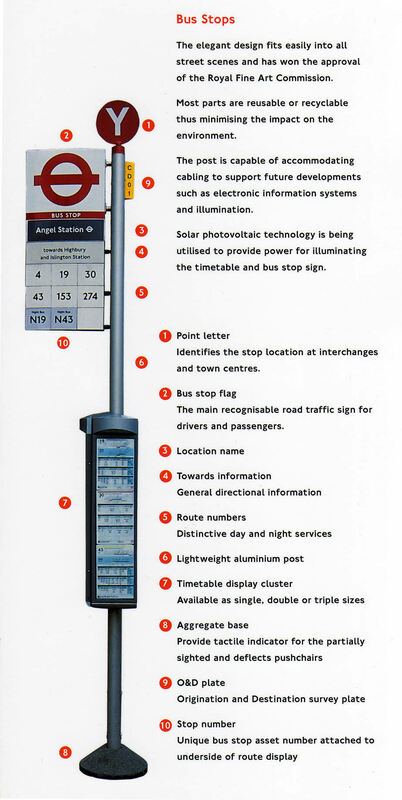 London bus stops extend beyond central areas and cover all routes in Greater London. Ivan indicated that passengers do not just want information about where they are travelling from, but when they get there, they need the same consistently presented information. People need information near their homes and local areas, not just in the centre of the city. Ivan also pointed out that many systems fail because they do not own their products. London Buses design and build their products and own the intellectual property rights. This allows TfL the freedom to change manufacturers without having to reinvent their products. Continuity of the brand is maintained and London Buses can continually work on evolving their products. The session concluded with a questions and answers forum. Unsurprisingly many of the questions focussed on manufacturing methods and material choices, but several of the questions were centred around brand identity and the roundel. A debate began on the use of the roundel and whether overuse was diluting its visual impact, a subject I am sure we all could have continued discussing at length, but time was pushing on and Mike sadly had to draw the session to a close. I have been to several events organised by the SDS, but this was one of my favourites. The presentation was filled with facts, history, illustrations and physical examples. Ivan is obviously very knowledgeable on the subject and passionate about his job and this came through in his presentation. I would like to thank Ivan, Mike, Michelle and the SDS for another great event. Hayley graduated in 2007 with a first class degree in Visual Communication. She now lives and works in London as a Wayfinding Designer for a large architectural practice. Her key projects to date include developing signage and information graphics for both Dublin and Rome Airport. Hayley’s thoughts and inspirations can be found in her regular tweets as Wayfinding_UK.